Down Syndrome is set of mental and physical symptoms that result from having an extra copy of chromosome 21. Many of these characteristics are well understood and are able to be managed. The related foot conditions are also generally well understood, although management and treatment of these often painful and debilitating symptoms are often overlooked or ignored. It should be noted that although children with Down Syndrome share some of the same characteristics, each child is different. Medical researchers have identified more than 50 characteristics which may be found in people with Down Syndrome. Most people will have only a few of these. 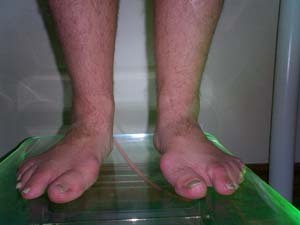 The combination of ligamentous laxity (loose ligaments) and low muscle tone contribute to orthopaedic problems in people with Down Syndrome. Often these characteristics become evident when children learn to walk, as specific physiological differences may be compounded by gravity. This is largely where Podiatrists can play a role in aiding Down Syndrome lower-limb development and coordination. The importance of comprehensive podiatric evaluation in patients with Down syndrome for the early diagnosis and treatment of minor orthopaedic problems is crucial. Treatment is directed towards the cause and is generally painless. If flat feet are implicated in the development of symptoms this can be addressed with soft rubberised, highly contoured foot orthotics to assist in maintaining good foot and ankle alignment. Hard plastic orthotics should be avoided due to pressure they apply to the arch in isolation, whereas soft full length orthotics can support the foot from heel to toe. Hard skin and thickened toenails can be treated painlessly with skilful removal by a podiatrist. This may need to be performed periodically to maintain comfort, although alignment of the feet with orthotics generally assists in this are too. It can often be a challenge to find footwear that both fits well and provides adequate support, whilst still being socially acceptable. Custom made footwear is expensive and rarely required, as brands such as New Balance offer width fitting up to 6E, and Dr Comfort and Kumfs XXW fittings at affordable prices. Our website has a full listing, and special orders are available. Orthopaedic surgery is an option for severe bunions deformities, rigid ankle equinus and other symptoms relating to flexible flat feet. Surgery is often the last option following exhaustion of all other conservative measures. Specific advice on the appropriateness of surgery can be discussed with your podiatrist.